The CPS 2000 was the first in the extremely successful CPS line of water guns made by Larami. 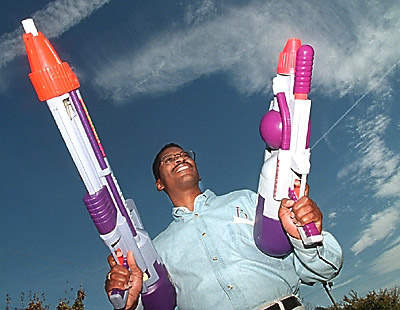 Some say it was the most powerful water gun of all time. Some say its range is over 50 feet. A rumor says that it was so powerful it blew some kid's eye out. Whether you believe that rumor or not, the CPS 2000 has a history of being extremely powerful. Use it responsibly. If you see one, pick it up. eBay is the only proven place to get these, however you will have to pay quite a large sum of money to get one. I've seen and used one of these myself, while it was when it was new (1996), I can still remember thinking that it was the most awesome soaker ever. Ah. The CPS 2000. 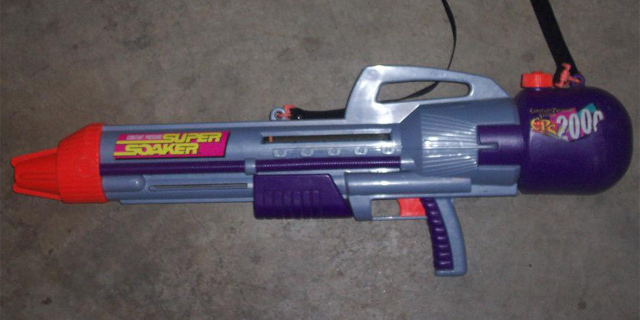 This legendary soaker could quite possibly be the farthest shooting and most powerful stock gun (un-modded gun) ever created. When I first got mine, I ripped the packaging off and felt in my hands pure power. The CPS 2000 was the first super soaker from Larami, featuring CPS tech. The technology was still in its baby stage however and problems arose. The first mark/version of the 2000 was so powerful that rumors speculate it shot a kids eye out. The truth to this story is still being debated, but the truth about whether or not it could shoot your eye out is very true. BE CAREFUL WITH IT! After some complaints to Larami, they were forced to reduce the power by elongating the rubber inside the PC and released the second mark/ version. The first time I shot my CPS 2000, my jaw dropped. I had never seen so much water go that far. The range of the 2000 varies from soaker to soaker. Mine goes a few feet over 50 feet. Contradictory to some estimates and calculations, the 2000 doesn’t take all that many pumps; about 18 to 22. The amount of water that comes out is scary. The nozzle features 30X output, meaning this thing puts out 30 times more water than an XP, Max-D, and SoakerTag. The amount of shots per tank is about 4 1/2. One thing that some people may have trouble with is the weight. Although I find the 2000 an easy to carry gun, others might find it hard to hold up and too heavy. Before you think that this review is everything about the 2000, I’ve only told you about half the story. My CPS 2000 is a mark 2. The mark 1 is the more legendary piece to this soaker and you may want to read up about it. Over all the CPS 2000 is great soaker. Range, output; all that stuff is outstanding. 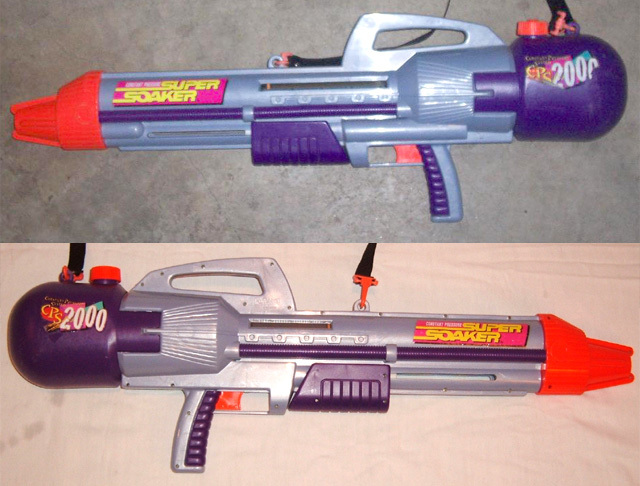 If you’re an experienced soaker enthusiast and you are willing to pay 100 dollars or more for this Super Soaker, get it. Unfortunately, the 2000 is no longer available in stores and the best place to look for it is on eBay.